A WiFi USB adapter is a small device that can make your desktop PC enjoy wireless lan connection or WiFi Internet. It is also very useful in situations where your laptop’s inbuilt wireless adapter got damaged or stopped functioning properly. It is a small device which when plugged in the USB port of your computer can let your connect to wireless devices or WiFi internet. It is also called WiFi dongle or Wireless USB adapter. Wifi USB adapters comes in different sizes and specifications and you should be very careful in choosing one. This is because a wrong choice can lead to poor performance and poor wireless range. I have previously written a useful guide on choosing a good wireless USB adapter which you can find below. How to Find a Good USB WiFi Adapter? But here in this post I will provide you the list of best USB WiFi adapters having different sizes (nano, mini, regular) and specifications with good range and performance. Here are the best USB WiFi adapters that you can use to enjoy wireless connectivity on your computer whether PC or laptop. 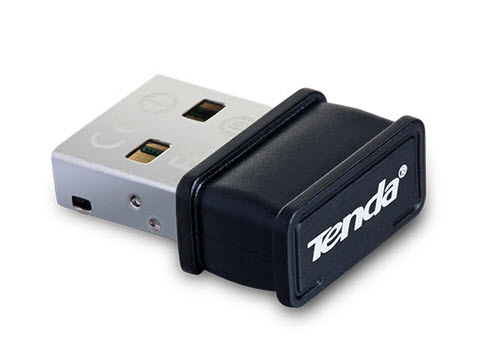 Tenda W311M is a high speed and long range wireless USB adapter for desktop PCs and laptops. This WiFi device is very compact in size and it has maximum wireless speed of 150Mbps. I personally have this WiFi USB adapter and it is working flawlessly in two of my computers. The device cannot be termed as nano because it is a little bigger in size and it can be classified as mini adapter. It comes with its own driver CD and you can use this wifi adapter for wireless internet & connection or for creating WiFi hotspot through its Soft AP feature that comes bundled with its software. The device supports Wireless N standard and speeds of up to 150Mbps. There is small green LED that glow during wireless activity. Must Read: What is Soft WiFi? The range of this little USB Wireless Adapter is amazing and you can get almost full wireless signal in a 2 story medium sized house or flat. The device also works with popular gaming consoles including PSP, WII and NDS to provide you an amazing gaming experience. Tenda W311M works with almost all operating systems including Windows, Mac OS and Linux. Highly Recommended by me. 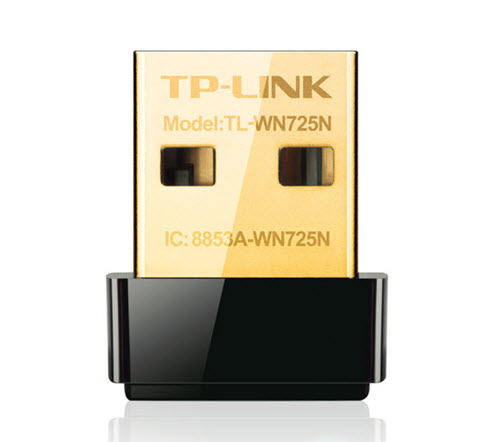 TP-Link TL-WN725N is a nano Wireless USB Adapter from TP-Link. It is a Wireless N adapter that supports speed to up to 150Mbps. It is very small in size and you will barely notice it when you plug it in the USB port of your computer. It can be used with both Laptop and desktop PC. Due to its smaller size the range of this device is pretty average but it comes with all the advanced features and Soft AP for creating WiFi hotspot. There is small status LED on the device for indicating wireless activity. This USB WiFi adapter supports Windows, Mac OS and Linux operating systems. This WiFi adapter is generally suited for laptop where portability and space is a matter of concern. A high speed USB Wireless Adapter from TP-Link that supports Wireless N and speeds up to 300Mbps. TP-Link TL-WN823N is a mini USB Wi-Fi adapter that means it is a little big in size but still it is very much compact and easy to carry around. The range of TP-Link TL-WN823N is greater than the nano TP-Link TL-WN725N wireless adapter. 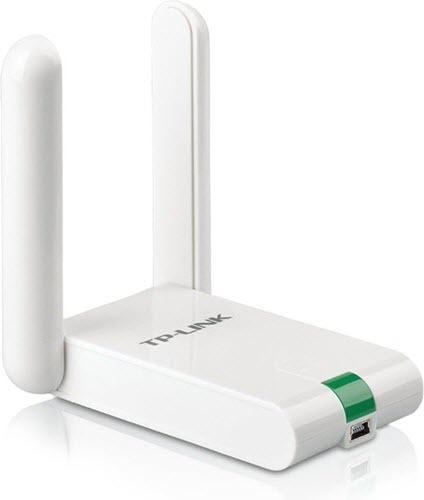 TP-Link TL-WN823N has got all the features including WPS and Soft AP which can turn your wired internet connection to PC or Laptop into a WiFi hotspot. A green LED indicator is there to let you know if the wireless activity is going on or not. It supports all major OS that includes Windows, Mac OS and Linux. 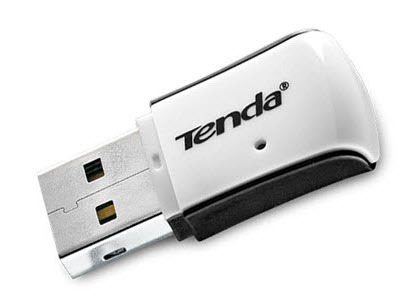 Tenda W311MI is small yet powerful USB WiFi adapter for your laptop or PC. The size of this wireless usb adapter is in between nano and mini. The device support Wireless N standard and maximum speed of 150Mbps. It has good range and has almost all the features that include security features and Soft Wi-Fi functionality for creating WiFi hotspot. Operating systems supported are Windows, Mac OS and Linux. 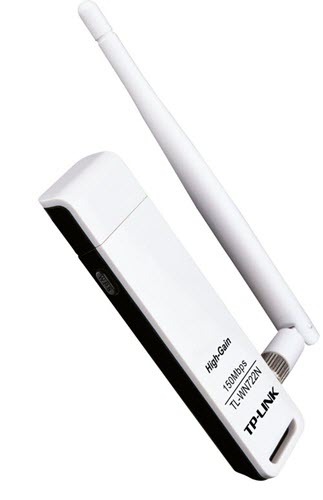 TP-Link TL-WN722N is high gain USB wireless adapter that comes with an external antenna. It is a Wireless N 150Mbps device that has a removable 4dBi external antenna for better wireless coverage and reception. Like other USB WiFi adapters it also supports all the necessary features that include WPS and Soft AP functionality for creating WiFi hotspots. This wireless usb adapter is most suited for desktops because of its larger form factor. It supports only Windows operating system (both 32-bit and 64-bit). 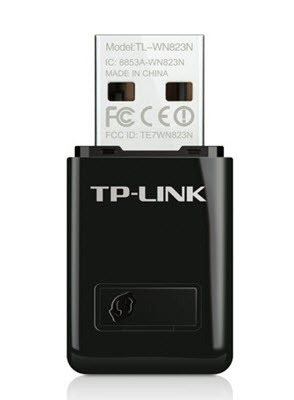 If you want a powerful USB WiFi adapter with excellent range then TP-Link TL-WN822N is for you. The device is big as compared to others but it is still portable to carry around in your bag. TP-Link TL-WN822N supports 300Mbps Wireless N speed and comes with dual 3dBi external antennas for better wireless range. This wireless adapter comes with 1.5 meter long USB cable which is used for connecting the device to your computer. It has got all the necessary features including WPS. Operating systems supported are Windows, Mac OS and Linux. So if you are looking for WiFi adapter that has reasonably long range then TP-Link TL-WN822N is the one that you should check out. 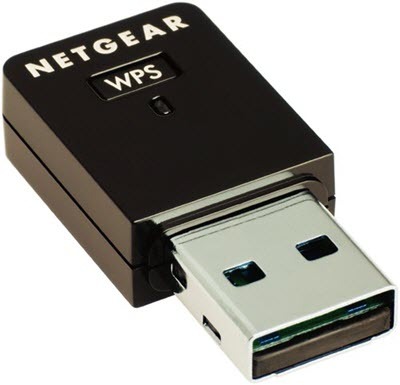 A compact, fast and reliable USB wireless adapter from Netgear. This Wireless N WiFi USB adapter supports speeds to up to 300Mbps and comes with all necessary features including security, WPS, Soft WiFi. The WiFi range of this device is good and is suitable for small to medium homes. There is a small LED indicator on it to indicate the if the wireless activity is going on or not. It comes with its Netgear Genie software which is very simple to install and use. It supports Microsoft Windows 7,8,XP,Vista (32/64-bit). Edmiax might not be a popular name as compared to the ones mentioned above in this post, but it is a very good company that makes quality networking components. 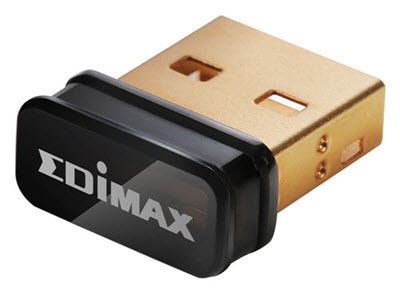 Here from Edimax we have Edimax EW-7811Un 150Mbps Wireless Nano USB Adapter which is very tiny in size. The maximum supported speed of this device is 150Mbps and it supports Wireless N standard. It is compatible with Raspberry Pi and Raspberry Pi 2 and works well without any issues. This USB WiFi adapter supports all security features including WPS. The range is average considering the size of the device. A small LED is there for Link/Activity. Operating Systems supported are Windows, Mac OS and Linux. Features 64-/128-bit WEP, WPA-PSK, WPA2-PSK,WPA-PSK/WPA2-PSK, WPS, LED Indicator, Green Power Saving. Well at last I would like to say that I have listed down the best USB WiFi adapters for PC and Laptop and they all are compatible with 802.11g/b devices. You should keep this in mind that smaller devices generally have poor to average range and bigger devices have good wireless range when talking about USB WiFi Adapter. If you have any queries regarding them or don’t know which one to buy for your computer then you can ask me by leaving a comment below. Your reviews are impressive and concise. Im using D-link 2750 u router which is placed on the first floor. I would like to connect my desktop which is placed on the 2nd floor exactly above the router. Im able to connect my mobile , tablet to the router with good signal strength. Which usb wifi adapter would you suggest for me as many of them do not mention the range in which they work. Im using windows 10 os . I suggest you to go for Tenda W311M Wireless N150 Nano USB Adapter. I am personally using with a PC in my home and i get good signals even on the 2nd floor. Thank you for your response Mr Akshat and keep up your goodwork. You are most welcome and please share this blog with your friends.